Nike sprinted into new territory this week with the launch of an original scripted web series. 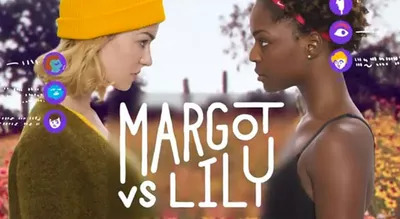 Nike sprinted into new territory this week with the launch of an original eight-episode web series titled Margot vs Lily. Staring Samantha Marie Ware and Brigette Lundy-Pain, the show is about two twenty-something sisters—one, a gym junkie who lacks social skills (Lily), and the other, a social butterfly who is far from athletic (Margot). The narrative follows a bet between them in which Margot must start a fitness channel and amass 1,000 followers before Lily (who has 900,000 YouTube subscribers) befriends three real-life pals. Directed by Tricia Brock (Girls, Mr. Robot, Silicon Valley, and Mozart in the Jungle) and executive-produced by Emmy-nominated Alfonso Gomez-Rejon (American Horror Story: Coven), Margot vs Lily is part of Nike's uber popular women's campaign #BetterForIt, which is all about consistently pushing yourself to be your absolute best. Not to mention, the series is a pretty ingenious way to inspire a generation of young women (hello, millennials) to incorporate exercise into their lives...and perhaps scoop up some killer Nike threads in the process. Check out the first episode below to watch these two get way out of their comfort zones, and determine if you're Team Margot or Team Lily. Then tune in on Mondays to see exactly how this sibling rivalry unfolds.